Does Alcohol Help to Relieve Anxiety? Limited alcohol use is often considered acceptable in many situations. The occasional nightcap to unwind or a couple of celebratory drinks during a social gathering are usually not problematic and may even be considered socially customary. But if you have panic disorder or another anxiety disorder, alcohol use may become a problem. Studies are increasingly showing a correlation between anxiety disorders and alcohol abuse disorders. According to the Anxiety and Depression Association of America, about 20 percent of people with social anxiety disorder also suffer from alcohol abuse or dependence. Alcohol is a drug that depresses the central nervous system (CNS). Initially, alcohol consumption has a sedative effect and produces a sense of euphoria and decreased inhibitions, seemingly providing relief from anxiety. Unfortunately, long-term effects of alcohol abuse aren't so pleasant. Chronic alcohol abuse may result in tolerance, dependency, and damage to many organs of the body, including the brain, liver, and heart. People with anxiety disorders, including panic disorder and agoraphobia, often use alcohol as a primary means of coping with fear and anxiety. One theory of why this occurs is the “tension reduction hypothesis.” Simply put, this theory suggests alcohol is used as a self-medicating method to reduce stress and anxiety. Some researchers have proposed that there may be a genetic link that influences a person’s anxiety level and alcohol consumption. These biological theories suggest that a brain mechanism is responsible for anxiety symptoms and drinking behaviors. Other researchers have proposed an expectancy component in alcohol consumption and anxiety symptoms. One would expect relief of anxiety symptoms after consuming alcohol due to its effects on the CNS. Drinking behaviors are based on one’s level of anxiety and the expected relief alcohol will provide. Relief from very high anxiety levels would be expected to ease with greater consumption of alcohol. 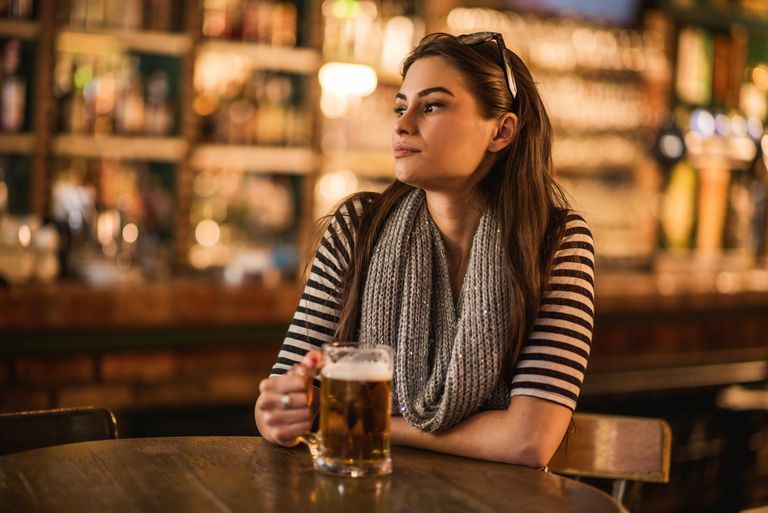 Social Anxiety Disorder and Agoraphobia: Problem drinking tends to begin after the onset of symptoms related to social anxiety disorder and agoraphobia. For example, someone who has social phobia may fear to go to a social gathering where there may be many unfamiliar people. Just the thought of attending such a gathering produces a lot of anticipatory anxiety. To relax, the person self-medicates with alcohol. Unfortunately, this type of drinking behavior has inherent problems. Alcohol consumption becomes a “crutch,” and social situations where drinking isn't possible may be avoided. Another problem is that long-term alcohol abuse usually means developing a tolerance to its effects. This results in increased alcohol consumption to get the desired result. Generalized Anxiety Disorder and Panic Disorder: For generalized anxiety disorder and panic disorder, studies have shown a different trend of alcohol use. Problem drinking tends to begin after or around the same time as symptoms of a panic disorder or generalized anxiety disorder present. This may indicate that some of the initial anxiety and panic symptoms experienced are related to alcohol withdrawal or that alcohol use has somehow provided a mechanism for these disorders to develop. These symptoms tend to create a cycle of heightened anxiety and increased problem drinking. *One drink = one 12-oz bottle of beer (4.5 percent alcohol), one 5-oz glass of wine (12.9 percent alcohol), or 1.5 oz of 80-proof distilled spirits. Some researchers believe that people with panic disorder or other psychological illnesses may have a lower threshold for alcohol tolerance. It may be possible to be “at-risk” even if you consume alcohol within the limits described above. If you have an anxiety disorder and are abusing alcohol, you should talk to your doctor or therapist. There are many effective treatments for both disorders, including ongoing individual and/or group therapy and prescribed medications. Although you may have begun alcohol use as a self-medicating measure, it's likely that it will cause you far more distress in the long run. It's never too soon or too late to get treatment for problem drinking. Anxiety Disorders Association of America. "Social Anxiety Disorder and Alcohol Abuse." Smith Joshua P, Randall Carrie L. Anxiety and Alcohol Use Disorders; Comorbidity and Treatment Considerations. Alcohol Res. 2012; 34(4): 414–431.